Today, in Agos' archive, there is an article by Hrant Dink, "A pigeon-like unease of my spirit", which was published in Agos on January 19, 2007. Today, in Agos' archive, there is the story of Surp Krikor Lusavoriç Armenian Church that is affiliated to Armenian Patriarchate of Constantinople. In 1998, it was confiscated by the General Directorate of Foundations. Today in Agos’ archive, there is a report about the reasons why the Patriarch Mesrob II Mutafyan hadn’t attended the food offerings (“love tables”). Since 2008, he has been in Surp Pırgiç Hospital because of his serious illness. Today, in Agos' archive, there is "1936 Declaration".Consituting the ground for seizing the properties of the minority foundations, "1936 Declaration" was the subject of a news report that was published in Agos in 1988. Today, in Agos' archive, there is an article by Sarkis Seropyan, who passed away last year and who was the Armenian editor and the "memory" of Agos.Seropyan commemorates Aleksandr Saruhan, the only world-renowned Armenian caricaturist, on the anniversary of his death. We continue sharing our archive with an article by Hrant Dink, in which he tells about his memories of Kamp Armen. In this article, which was published again in the first issue after Dink’s assassination, he reveals the desperate condition of the camp. Agos's Archive: How did Saint Theodore Church become Kurşunlu Mosque? 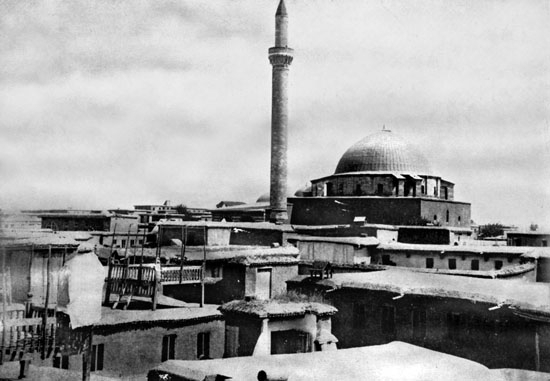 In Agos' archive, there is a journey to the history of Kurşunlu Mosque in Sur province of Diyarbakir, which was damaged because of a fire caused by bombs recently. Here is the story of Saint Theodore Church's transformation to Kurşunlu Mosque by Sarkis Seropyan.